Levine continues her tradition of reworked fairy tales with strong heroines begun with Ella Enchanted (1999) in this delightful tale of a bright young girl who can stand up for herself and the sheep she guards...A must-have. Best known for spinning new interpretations of classic fairy tales, Levine (Ella Enchanted) here ventures into folktale territory with a perky, girl-centric take on The Boy Who Cried Wolf...Hilarious hand-lettered asides (The pie is mightier than the fang; Baaaaaad sheperdess!) 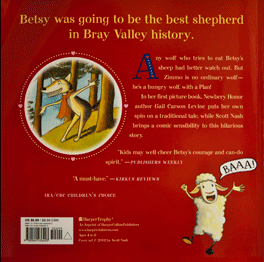 give the sheep personality and lend the proceedings a snappy tone...Kids may well cheer her courage and can-do spirit. In this amusing retelling of the classic fable, eight-year-old Betsy has just taken the Shepherd's Oath...Nash's cartoonlike illustrations, with their clean lines, crisp colors, and folk-art touches, add considerably to the story. This pleasant addition could generate discussion when paired with the original tale. This story takes a lighthearted approach to the traditional fable and teaches that sometimes people should be believed even when the evidence indicates otherwise. The illustrations add to the lightheartedness with an almost comic appeal.